When it comes to individual systems in your car, truck or SUV the engine plays a major role in the overall operation of the vehicle. With proper care and maintenance most vehicle engines will last for hundreds of thousands of miles without major problems. However, a lack of service and the occasional lemon can result in an engine that suffers from early wear and tear. Regardless of how many miles are on your car's odometer be sure to keep a look out for the following issues and if you run into any of them make an appointment with your local auto shop for proper engine diagnostics and repair. If you can hear a knocking noise coming from under the hood of your car that rises and falls in repetition with the engine RPMs than there is a good chance of worn engine bearings. The bearings are what many moving engine parts rest on, should they seize you'll be looking at a need for major engine repair or possibly an engine replacement. If you notice increased levels of exhaust smoke that seems to have a tint of color too it, you'll want to get to the auto shop ASAP. Depending on the color of the smoke you can often tell what sort of problem is occurring. White smoke means that coolant is burning up in the combustion chamber, black smoke means too much fuel is being used and blue smoke is a clear indication of an internal oil leak. There are many things that can result in a decrease of performance for your vehicle. You may notice the engine idling poorly or even dying at times, or a significant drop in fuel economy. Other issues may include poor acceleration or difficulty holding speed. These types of problems are not only cumbersome, they can be dangerous as they alter your ability to properly control your vehicle. One sign of trouble will stare you right in the face, the check engine light. While many drivers tend to shy away from getting check engine light issues looked at it is important you get to the shop as soon as the light comes on as most of the time a small, expensive fix will resolve the issue. Putting off the repairs will allow the problem to grow bigger and more costly. When it comes to auto care it is important to act on engine problems as soon as they become noticeable. For quality engine repair in Covina call Hye Tech Auto at (626) 332-5452 to request an appointment. 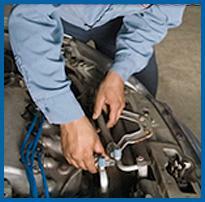 Our auto repair experts will be able to take care of any issue your vehicle is suffering from. At the first sign of car trouble, head to Hye Tech for professional car repair in Covina!